In this series, we’re looking at patterns in writing. These patterns include dramatic structure, themes, character archetypes, and conflict. In this unit, we’ll be using a Frayer Model-style concept attainment with definitions, essential characteristics, and examples/non-examples to define each act of the plot. My goal with these lessons is to equip my students with a sophisticated set of tools to write with. Writing programs tend to start and end with setting, character, and plot. By showing my gifted students the authentic tools of an author, they have a higher level to aim for in their writing. Plus, it’s a blast reading your students stories as they integrate sophisticate plots, themes, conflict, and character archetypes. Refer to the unit’s generalization “structure increases creativity.” Often, authors use an existing structure to organize their plot. Using these terms, we’re going to explore the plot of Finding Nemo. Definition: In the exposition, the reader meets the protagonist and sees life before the conflict starts. Main plot has not started. Marlin’s cautious nature is shown when he goes in and out of the home indefinitely, checking for danger. Nemo’s ‘lucky fin’ is revealed, showing that he was physically affected by the baraccuda attack. We also see that Nemo is a regular kid, annoyed by his father’s worrying. Marlin is socially awkward, revealed through his terribly unfunny joke. The real conflict does not begin in the exposition. Nemo’s capture and Marlin’s attempts to find him are not part of the exposition. In Finding Nemo, the conflict truly begins when Nemo is taken by the divers. This is known as the inciting incident. It is the origin of the next act, the rising action. Inciting incident: Nemo is taken by the divers! Marlin goes through the jellyfish. Nemo gains the friendship of the aquarium fish. Nemo attempts to escape the aquarium. Definition: The climax is the peak of the action. It could be a huge battle or an exciting action scene. Most intense, exciting moment of the story. Example from Finding Nemo: The search for Nemo intersects with Nemo’s own adventures in the dentist’s office. The climax continues into the ocean, reaching its peak when Nemo rescues the fish trapped in a net. Can you imagine if the movie simply ended in the middle of all the excitement of the climax? We would never know how the big battle turned out or if the heroes were all safe. Definition: The falling action is a short but vital part of the story that resolves the climax. Example: In Finding Nemo, this is when Nemo saves Dorie and Marlin learns to trust his son. Non-Examples: The falling action should not leave the reader confused. A great dénouement shows how the characters have changed. Marlin finally tells his whole joke. Marlin is no longer over protective of his son. Nemo is confident and happy. Break students into groups of four to participate in a practice session of identifying the plot elements of popular stories. I give a selection of choices such as: The Lion King, Harry Potter, Star Wars, etc. I’m fine when groups use a story not on the list too. Each group should work with a different story. 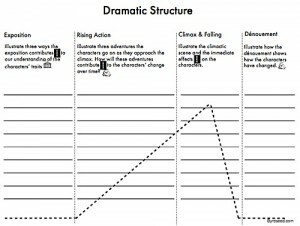 Groups analyze their story’s dramatic structure using a Freytag Triangle worksheet (pdf) and then present their work. These samples will go up as reminders and references. Students will develop their own Freytag Triangle (pdf) based around an idea for an original story (perhaps one they’ve created as part of this unit). Refer back to the unit’s theme: “Structure increases creativity.” Note the wide variety of excellent, creative stories that use this plot structure. Preview that students will be creating their own stories based around this pattern.